Spotted my friend Penny out circle walking yesterday. In addition to the short spiked hair and the capris (the Shangri-La dress code is still in effect), she was sporting a cast on her left arm. It seems she went to the Castle Dome museum, which unfortunately doesn't yet have indoor plumbing. For the convenience of customers, they have porta-potties outside. It turns out that these also make a very nice, cool shelter for snakes. Penny walked in and came face to face with a rattlesnake that gave a warning and then reared up, ready to strike. She backed out in a hurry, fell down and broke her elbow. On the plus side, she forgot all about having to pee. I have heard reports that someone in the area was struck by a snake while walking in the desert. 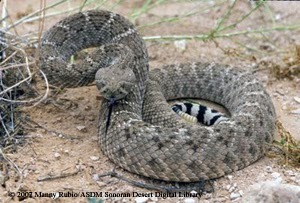 The recent heat wave has awakened them (the snakes, not the snowbirds) and, as I suspected, rattlesnakes wake up grumpy.